Time Was . . .
an' farm Time was people would sit and talk of their kids, their neighbour’s kids, and their future. "Well, little Billy don't seem to bright, he don't take much to learnin' so I guess he'll just stay home an' farm with Pa ". non-farm For the most part, I believe a lot of non-farm people still believe that’s the way it is down on the farm. needed Today for one to be involved in farming you need a degree in agriculture. You need to be well versed in the sciences of chemistry, biology, mathematics and finance. If you don't have a skilled knowledge in the industrial arts of mechanics, hydraulics, welding, wiring, carpentry, the art of weather forecasting and the folklore of weather trends unique to the region in which you live. If you are lacking in these skills, your future is not "down on the farm". 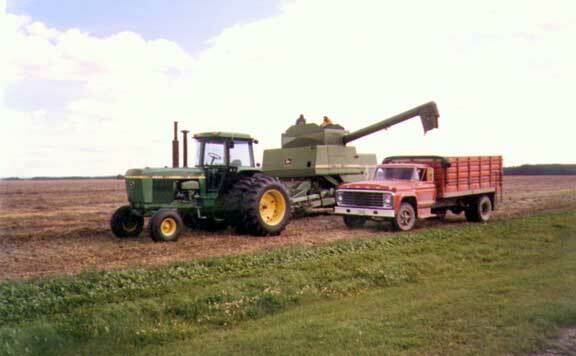 down In 1975 for example we bought a new 125 HP John Deere 4430. It was $15,000. We also bought a new Chev pickup: for the Silverado we paid $5,700. A new Mercury Marquis also found its way into the yard, another $5,500. 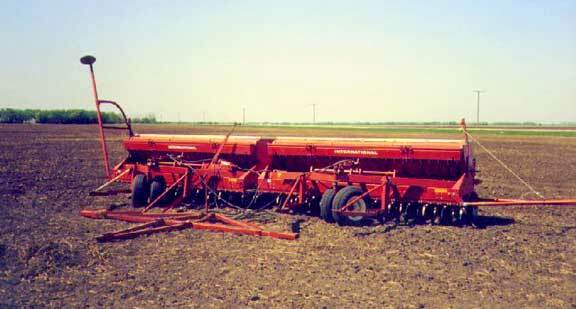 Wheat sold for $4 a bushel; oil seeds ran between $8.50 and $9.50. We paid cash. 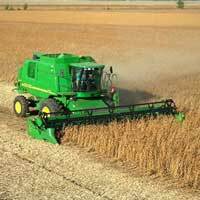 Today a replacement tractor would run you $175,000, trucks go for $35,000 and that’s a conservative price. Granted, that 1975 model didn’t have power windows, A/C, extended cab or 4WD, but 25 years later grain prices have gone down, not up - as inflation has. When the bell rings this spring no one knows how many farmers will be able to answer the call. With the international price war on grain and Canada’s Cheap Food Policy, the asset base of the individual farmer has been eaten into so far there may not be enough left for security on this years operating loans. In the 70's, the only loans we serviced were for land. When the national media does cover western agriculture its usually from an eastern viewpoint by someone who has no connection to the land. step Young Billy left the farm. When interest rates hit 25% in 1982 he moved to the city, got a job in a warehouse. Barb Beyers sees to it he doesn't work 100 hours a week for a wage less than his father received in the 70's. All of his costs are fixed - every month the mortgage is the same. He pays $50 a month for sewer and water - if the water line freezes someone comes and fixes it at no cost to him. He doesn't have to drive ten miles to town on gravel roads to get the mail, its delivered right to his doorstep. No charge! Remember the fuss when the Super Mailbox came onto the scene? My God, Billy had to walk to the end of his block, and maybe say hello to his neighbour. Down on the farm, Canada Post still charged his parents rent for their mailbox, ten miles from home, over gravel roads, even when it was 40 below. grumble Yet Billy will crack a beer, turn on the news and grumble about what the farmers are crying about now.